If your website is in /home/user/public_html, consider using /home/user/static_html as the output directory. Simply Static will only generate your public posts and pages. This means that if you have a hidden page that is not linked to from the navigation or within your site, it won’t be included in the output. If you want these pages, make sure that you are including any hidden pages in the settings. Now go to the Diagnostics page and make sure you have green lights across the board. 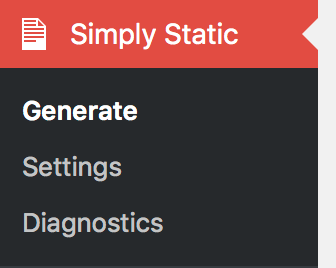 If all is good, go to Generate and click the Generate Static Files button. Simply Static will take a while to generate your static site. Now you can visit that URL to preview your static site. If there are missing files in the static site, update the Simply Static settings and include the URL to the file. Delete the generated site and generate a new copy. The missing file will now be included in the static site. You could also delete the old WordPress site completely if you’ve backed everything up. Enjoy your new static website. 1 Comment on "Convert a WordPress website to a static website with the Simply Static plugin"